Tips for Eurail - Auf Teufel komm raus! For me, there are few things that are more enjoyable than traveling Europe in a flexible manner, by train. It doesn't cost a lot of money to do that. First of all, there is a huge variety of Eurail tickets; if you decide to explore one single country for a week or so, there are fairly cheap tickets to do so (see eurail.com). If you want to do more traveling and you don't have a lot of money, I can give you some ideas about how to make Eurail both affordable and adventurous. As for me, I try to stay at youth hostels and other types of paid accomodation as little as possible. Youth hostels are anything but flexible (in summer, it's highly recommended to book youth hostels well in advance), you have to search for them, and in some countries they are very low standard. One great alternative is „Couchsurfing“, where people from all over the world invite you to stay at their place for free. For this, you will have to write messages a few weeks in advance. Also, in some places you might not be lucky. However, it is a great way to meet new people in their respective cultures. The main site for couchsurfing is www.couchsurfing.com. There are youth hostels that I would most definitely exchange for any forest. That's what I usually do: Look for a forest and sleep there; you don't even have to bring a tent (It might still be sensemaking to bring one; for you might not always find cover and there could be mosquitoes). If you don't have a tent and you don't have a forest and it is raining – sleep under a bridge, in an empty stable or in an old shack – with a little imagination it's not hard to find some kind of cover in the countryside. If you are in a city and want to sleep outside, take a suburban train to anywhere. Fewer lights mean that you have reached the countryside, and the nearest forest might be just behind the next train station. Of course it is a good idea to not wait for the night but to look for possible sleeping places when you approach a city. You can also check out a tourist information to look for a free plan of the region. Don't forget your sleeping bag and a flashlight. Keep in mind that in many countries, camping in random places is not officially allowed (Here’s a short list of countries that do officially allow it). Another great possibility to get through the night is a night train. If you don't want to spend the night in a seating car, you can get a sleeper for a supplement, and in the morning you are in another place. For example, a sleeper on the night train Berlin-Malmö requires a supplement of € 29 (no seating cars), and the ships between Sweden and Finland offer a variety of discounts. It's good to get a shower every once a while, but a lake or a river works, too. Also, some train stations and ships have showers. If you need electricity to charge your camera, have a closer look at your train, train station or shopping mall. If you are really desperate, charge your camera in the restroom; that is a place where almost any train provides a power outlet. In certain places, you should be more careful when sleeping outside. For example, there are still countries with mines in the ground, and neither is the site of the former iron curtain recommended for sleeping. As for exploring a city: See www.neweuropetours.eu to check for a “Free Europe Tour”; they only cost a tip and they are usually really good. In most cities, you can get a free map of the place at the tourist information. Remember that Eurail is not just about big cities… There are lots of lovely villages, lakes and mountains that are perfectly accessible by train. Scandinavia is very expensive; you might want to live out of the supermarkets rather than eating at restaurants all the time. Also, northern Scandinavia gets very cold at night; take a tent and a warm sleeping bag or sleep inside. I prefer to travel with friends, but there is one definite pro when you are on your own; you get to know more people. 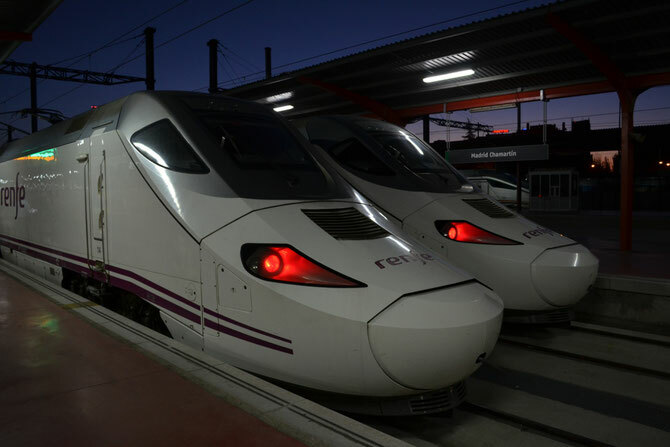 The Spanish bullet trains are called AVE.